Do you have a child who likes drawing? Have you tried the new app Drawp? Drawp is a drawing app, but it is much more than drawing. Kids will enjoy creating art, as well as learning alphabet, numbers, and storytelling. First let’s look at the drawing features. I am quite impressed with the number of choices kids have on paint color and stroke textures: solid lines, square shaped lines, blurry lines, or multicolored lines, … There are over 200 colors and textures for kids to create different art effects. Kids can add text with many different color and font options. They can also add voice recording. I really liked their different canvas options. There are coloring pages created by talented artists. Currently it is the art by Chuck Gonzalez who has illustrated for Scholastic, Chronicle Books, and Babble Magazine. Some of the art are for coloring, some are drawing prompts that invite kids to add more on the pictures. Also in the canvas, are seasonal pictures, such as a blank holiday card, a Christmas tree to be decorated, and a gift box that is all white. If you are looking for some academic learning, there is a set of Alphabet Punch coloring page where kids will see 26 fruits, each starting with a different letter, with letters on the page for tracing. In addition, there are Counting Animals, Dinosaurs, Going on a Trip, and more. Kids can save their art works in the app and then share with up to 16 parent-approved family members or friends. The sharing is done via email or text built in the app system, so kids are not exposed to internet. The saved artworks are in Drawp cloud space, so they are not taking up any space on your device. Kids can save as many art creations as they want. Drawp is a drawing app for kids with diverse features. 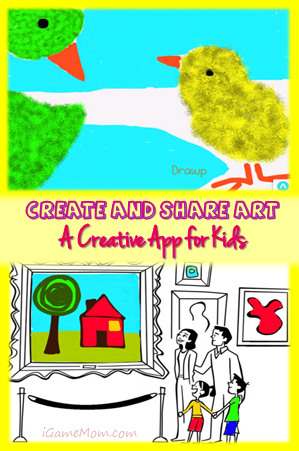 Kids can draw, color, take photos, add text, create different art effect with many art features. They will also have the opportunity to learn letters, words, and numbers. It is a fun app for creativity and imagination. Drawp is available for iPad on the App store for $4.99. A Lite version is available for free and allows users to purchase additional paints via In-App Purchase starting at $0.99. Next post: App Deals : Holiday Sale on all StoryToys Apps! Awesome! I happen to have a couple of little ones in my life who will love this! It is a fun app. I enjoyed it.